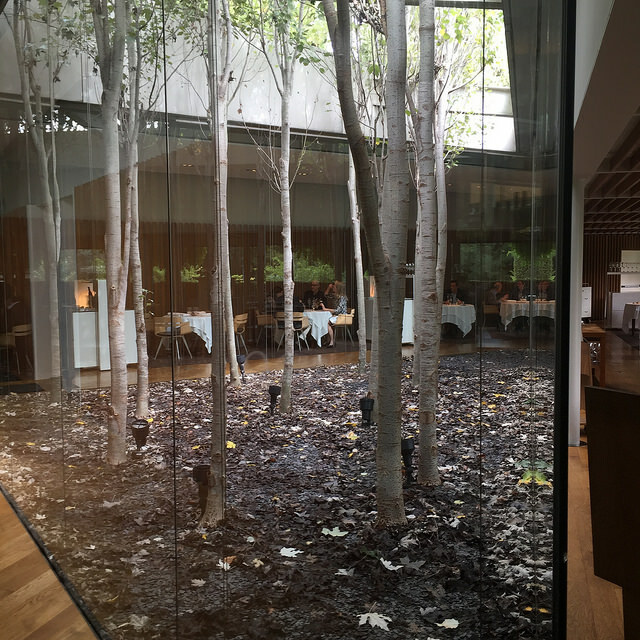 El Celler de Can Roca: Food & Wine at its best! 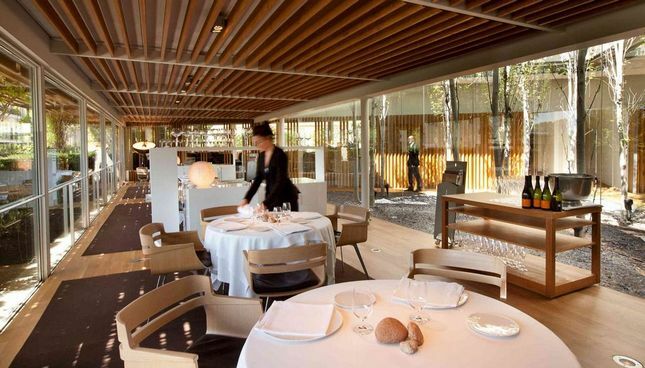 El Celler de Can Roca is constantly on top in several restaurant-rating lists. 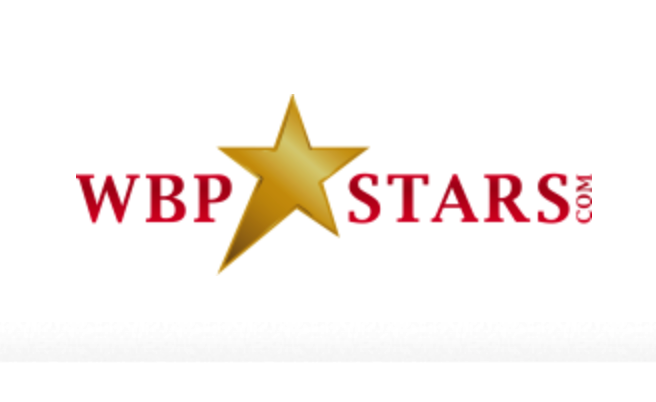 This three Michelin starred restaurant in Girona Spain currently holds a first position on the World’s 50 best list and ranks second on the Wbpstars website. 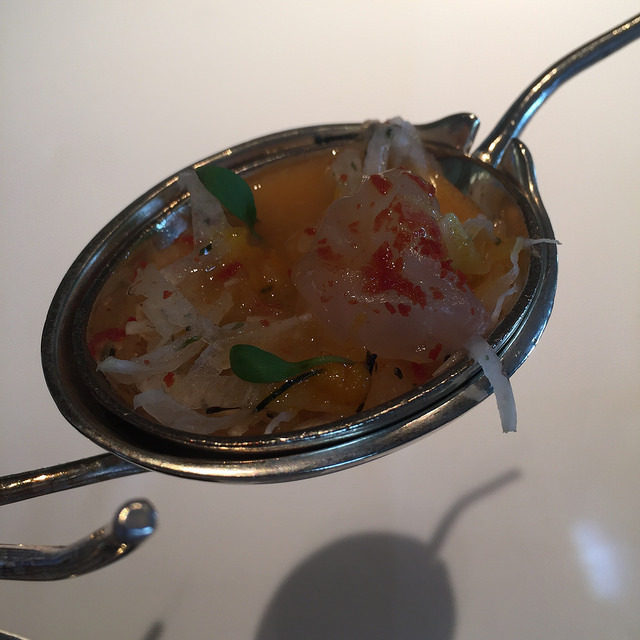 Three chefs – One vision! 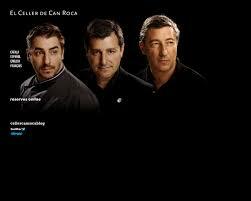 The three Roca brothers run the restaurant: Joan Roca is the eldest and the Kitchen Chef. 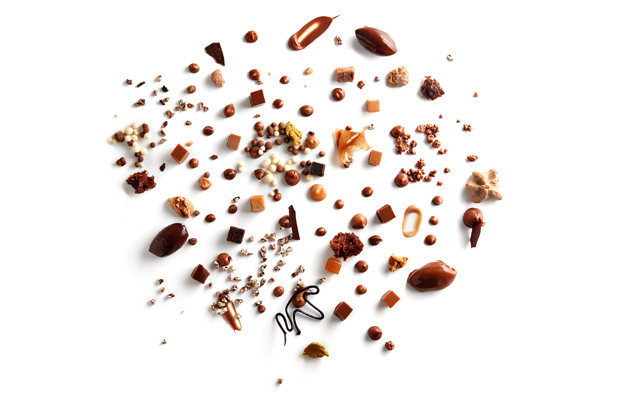 Josep Roca is Sommelier and known as one of the best in the world and Jordi Roca is the Pastry Chef. 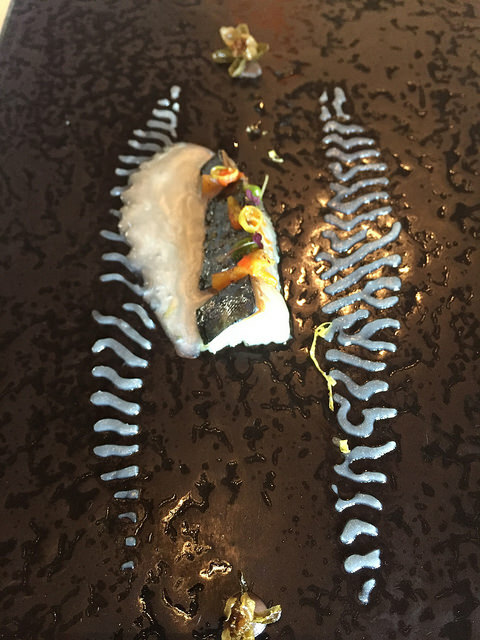 El Celler de Can Roca is a success story from a third generation. In 2007 the restaurant moved to a modern and stylish building just about 100 metres from the original parents restaurant. 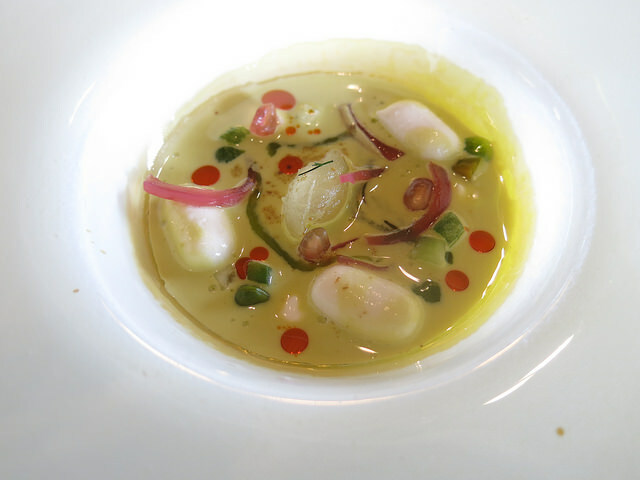 The new location was custom-built for the modern restaurant and synergizes with the cooking style. 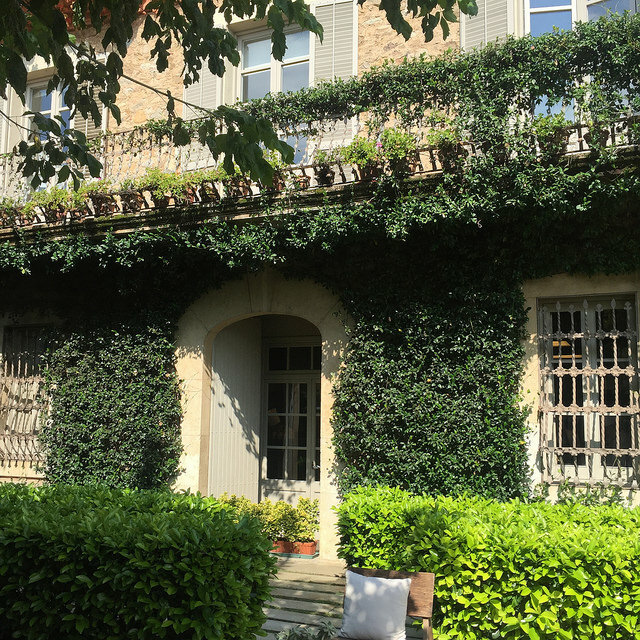 The restaurant is situated in Girona, a medieval old town that locates about 60 miles north from Barcelona. A meal in the tranquil glass-walled dining space is a great experience combining innovation, creativity and comfort. The restaurant is known for its large wine selection and the two enormous wine lists (white & red) are almost too heavy to carry. They have one of the world’s most amazing wine cellars divided into separate rooms depending on the wine region. 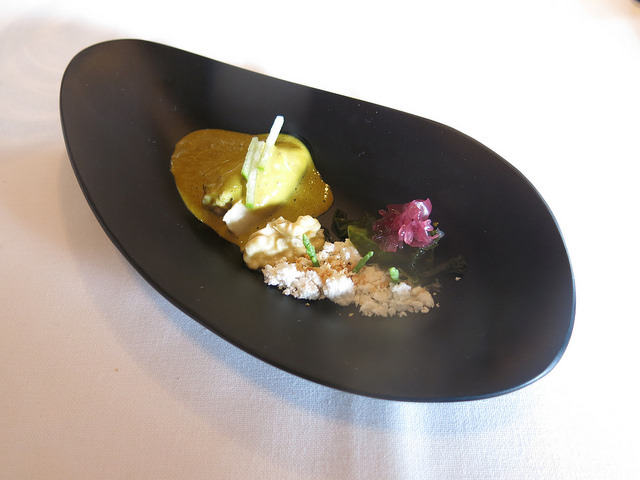 Restaurant El Celler de Can Rocca acts at the top of the world because of their constant evolution of the dining experience. 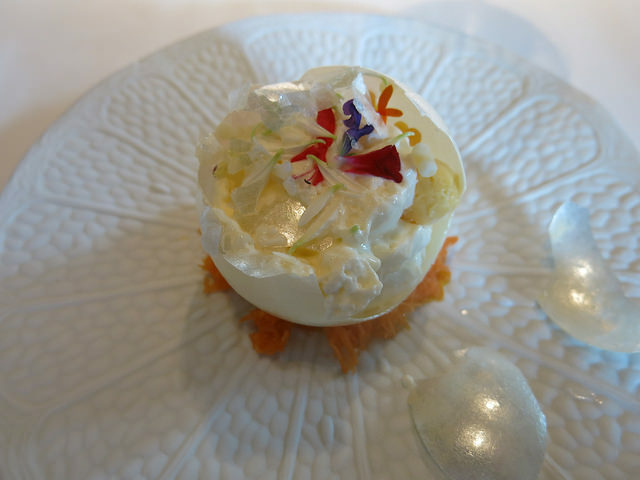 The dishes are based on the best ingredients and prepared with high levels of technical skills. 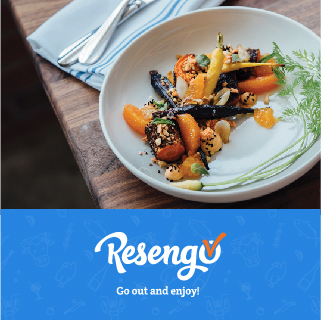 Crucially, this is a restaurant that has never forgotten its humble roots, its sense of familial warmth, or the need to serve remarkably delicious dishes and outstanding wines at an affordable pricing. 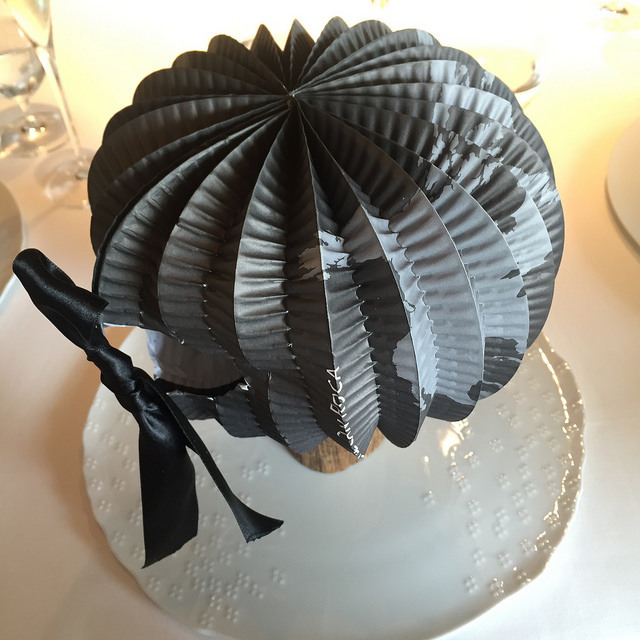 Two menus were available; the classics menu with eight courses or the feast menu with fourteen courses. As we’d travelled such a long way we opted for the latter. 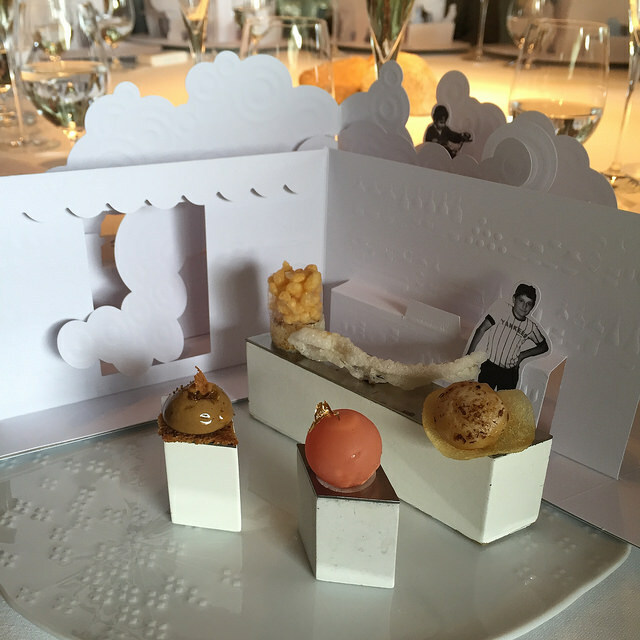 This lunch experience showed a sophisticated, inventive and intelligent cuisine. The thematic presentations contribute to the story telling servings. We started our tasting menu with a cava from the own produce. 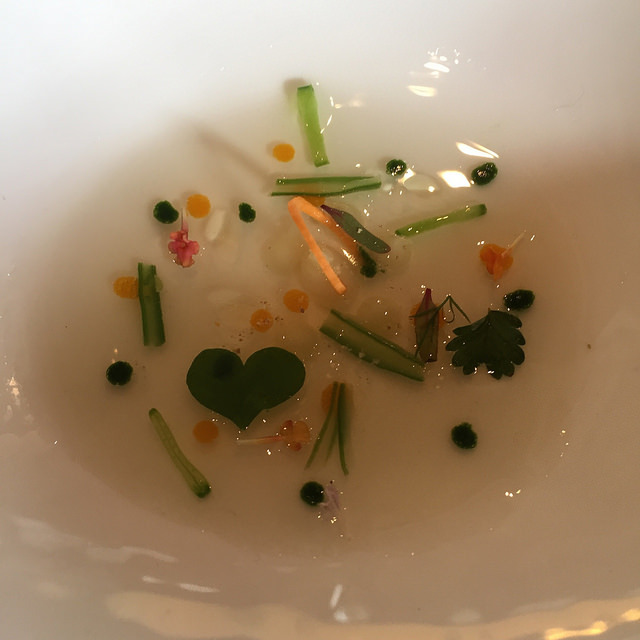 Autumn vegetable stock: mashed parsnip, carrot, liquefied pumpkin, spinach emulsion, field peas, flat beans, flowers and leaves. 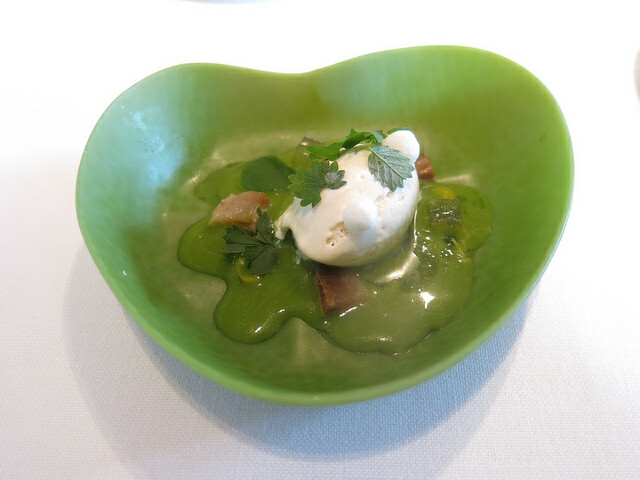 ‘Ajoblanco’ ice cream with merengue of Jerez, chlorophyll and sardine. This dish was served with an excellent Muscadet sèvre et maine 2005, Le Fief du Breil from the Domaine de la Louvetrie. Mackerel with pickles and mullet roe: mackerel sauce with wine, lemon, capers and chillies in vinegar, fried tomato, mullet roe, mackerel marinated in sugar and salt. 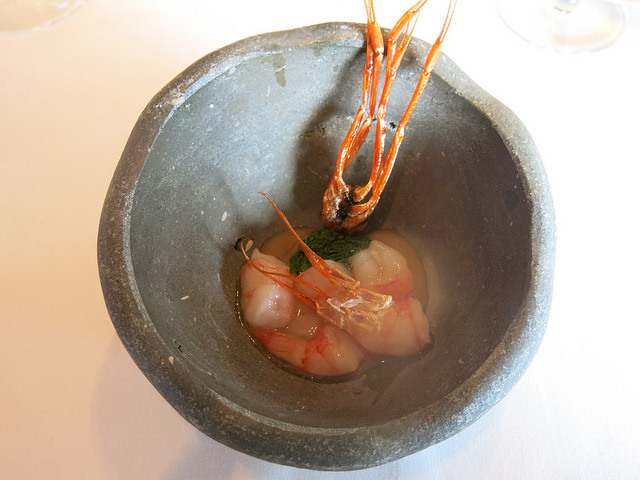 Prawn marinated with rice vinegar: head juice, crispy prawn legs, seaweed velouté and phytoplankton. 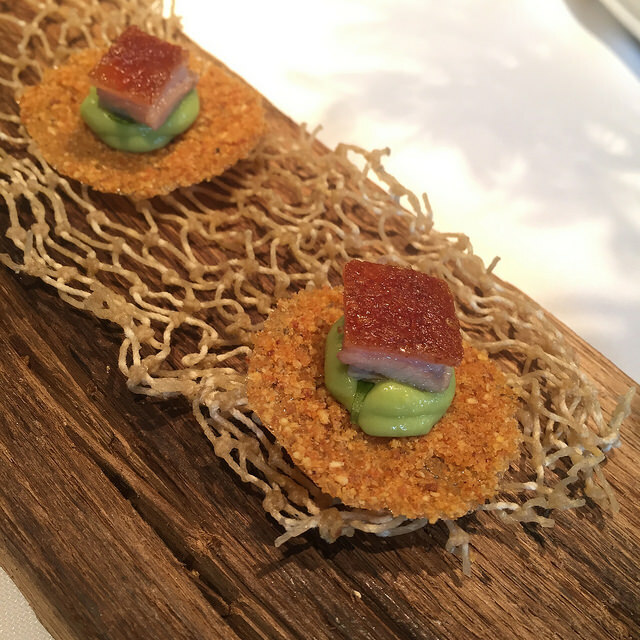 Josep Roca is matching this complex dish successfully with one of my favorite riesling wines, the Rottgen 2010 Reserve from Weingut Heymann-Löwenstein in the Mosel. 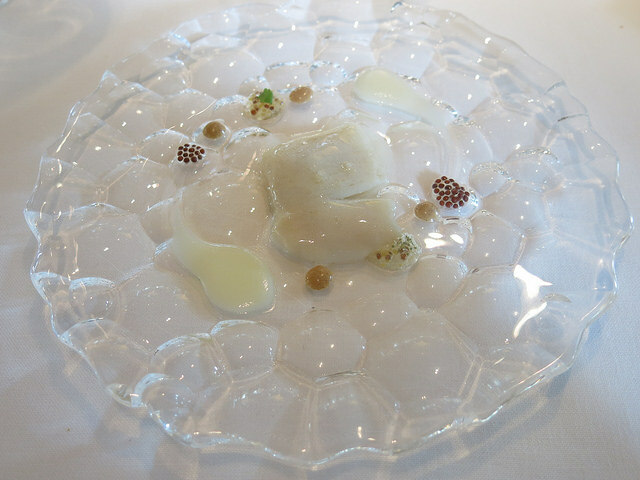 Oyster with anemone: anemone sauce, ‘ajoblanco’ sand, tender walnut, seaweeds and apple. Confit skate with mustard oil, beurre noisette, honey, chardonnay vinegar, bergamot, aromatic mustard, confit capers and smoked hazelnuts. 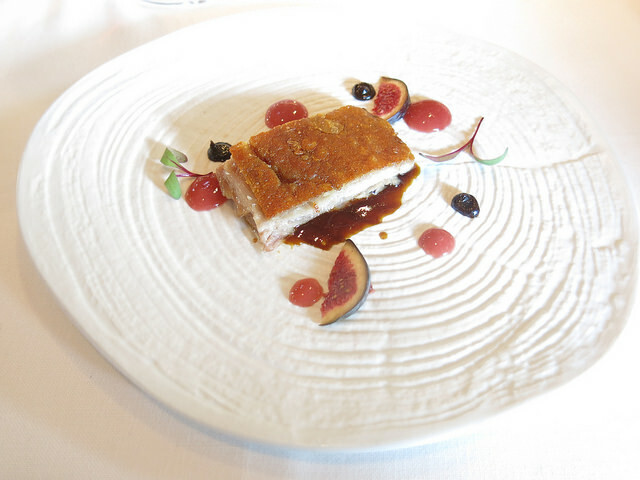 Iberian suckling pig with figs and carob mole came with a Ribera del Duero, Goyo Garcia from finca vinas de Arcilla. 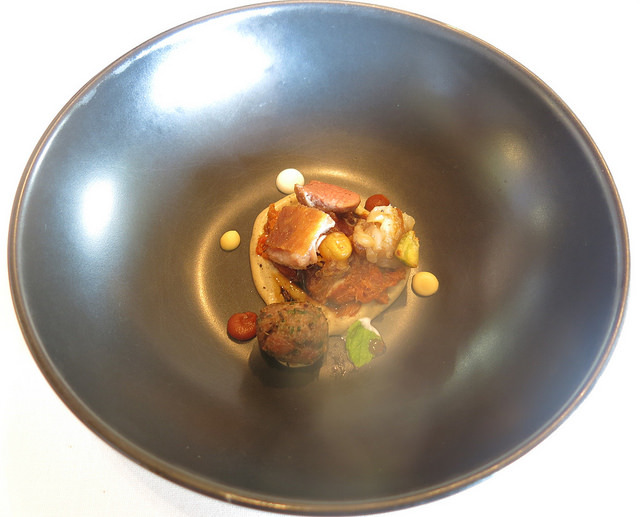 Lamb with eggplant and chickpea puree, lamb’s trotters and spicy tomato. 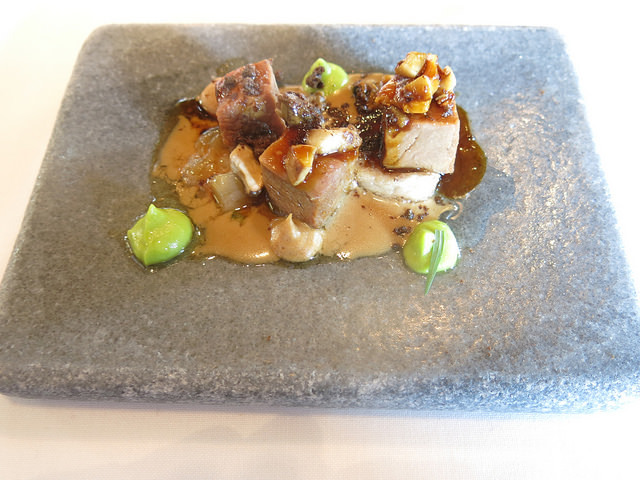 Veal oyster blade and tuber aestivum, marrow, tendons and avocado. 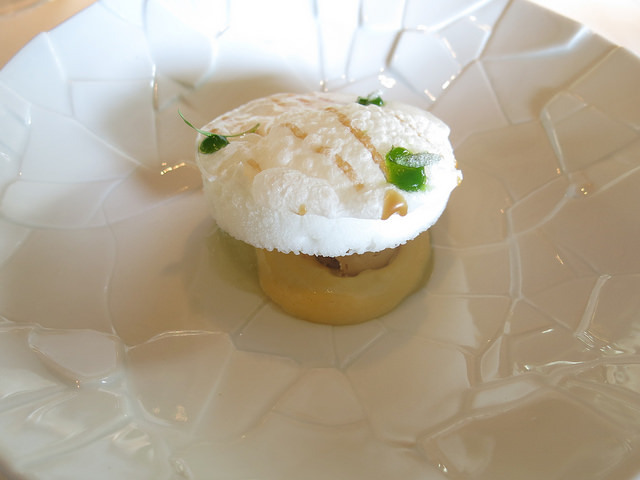 ‘Suspiro limeno’: milk, lime, coriander, milk caramel, pisco. 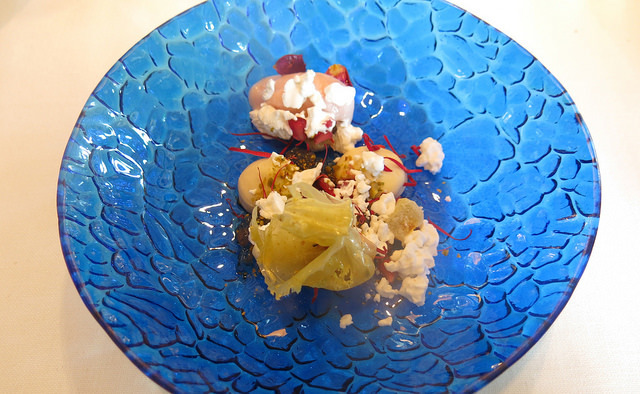 This first dessert was served with again an amazing wine combination. 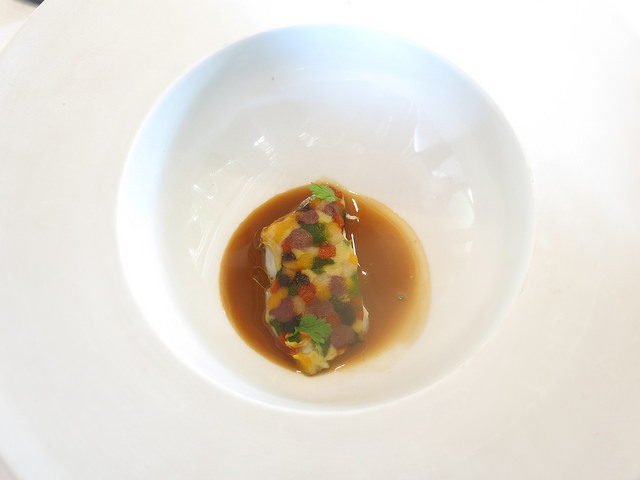 The Vina Tondonia, Cosecha 1994 from Lopez de Heredia in Rioja matches perfectly with the caramel in the dish. Turkish perfume: rose, peach, saffron, cumin, cinnamon and pistachio. Another blast with the Riesling spätlese Scharzhofberger 2006 from Reichsgraf von Kesselstatt 2006. 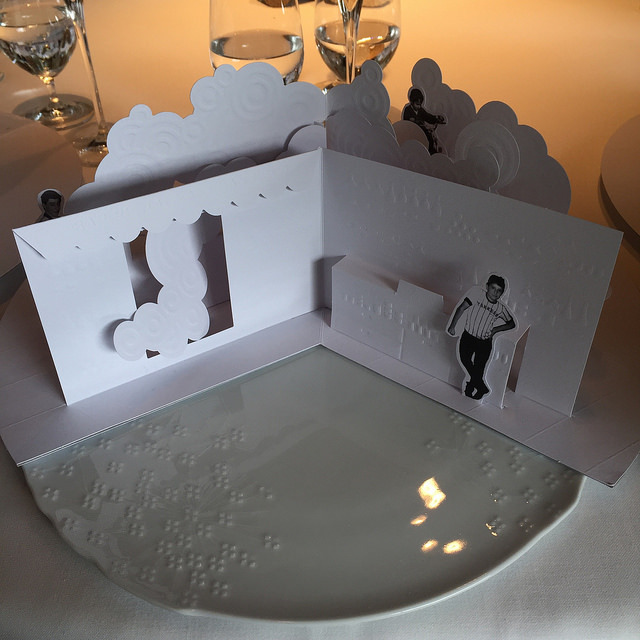 Our tasting menu at El Celler de Can Roca was very good, even great. 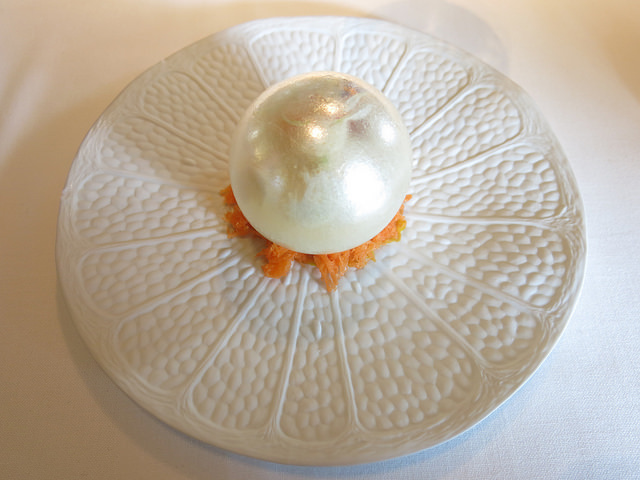 As expected for being on top of the world they serve very intense and inventive dishes by using extremely well executed techniques. 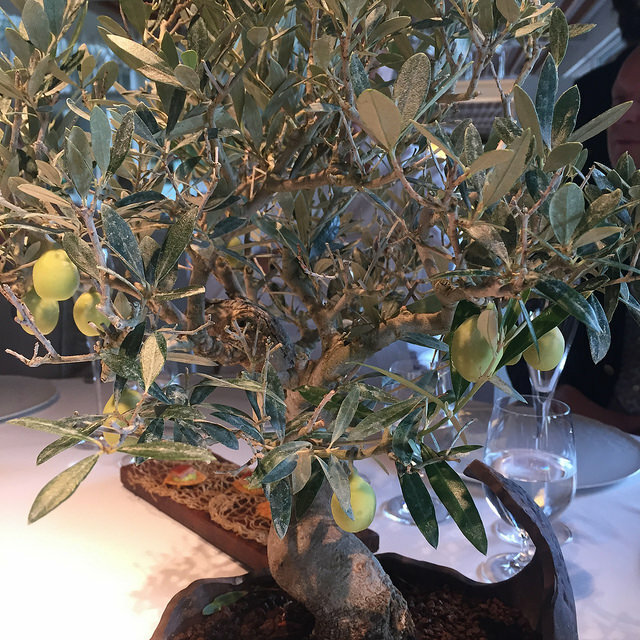 Is this the best food experience one can enjoy? Difficult to judge and comparisons are never easy. Different people always have different experiences. The wine pairing was for sure one that you will hardly find anywhere else. 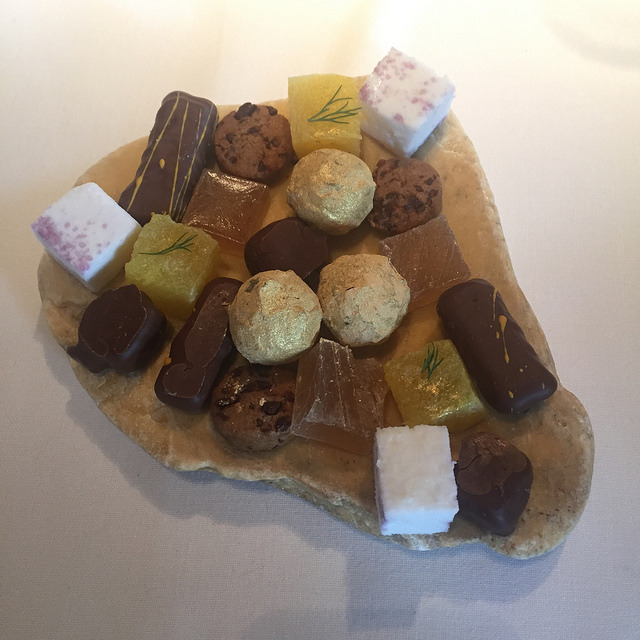 The amazing combination makes El Celler de Can Roca for sure a must visit! Last updated by begusto at 01/03/2016 . It’s a pitty you don’t write about the wine pairing. What do they serve? Sorry, just noticed the wine pairing.